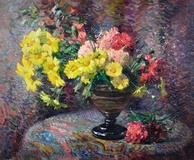 Jean Chaleye - Still life of Carnations & Marigolds - Online gallery supplying original fine art. Trending Modern British and Contemporary Welsh. Available for sale from Big Sky Fine Art; this original oil painting by Jean Chaleye.<br> The painting is presented and supplied in a late 20th century elaborate frame. <br> <br> Jean Chaleye was considered one of the most important French post impressionist artists. He was born to working class parents on 22.4.1878 at St. Etienne and died at Le Puy in 1960. He trained at the Ecole des Beaux Arts in Lyon, then at the Ecole Nationale Superieure des Beaux-Arts in Paris. He began his career as a commercial engraver then worked for a while in the textile industry where flower painting had developed as an important discipline and was used decoratively in the manufacture of silk. Along with a group of other artists he began to paint flowers in a new fashion, rendering them light and transparent and full of grace. His still life paintings of flowers, which he continued to paint throughout his life, are among his very best works. <br> <br> In 1902 Jean Chaleye took part in the prestigious Fair of French Artists and subsequently exhibited widely, including a retrospective at the Organerie Du Luxemburg, Paris and the Wally Findlay Gallery in New York. In 1953 the city of Marseille held a jubilee exhibition to celebrate his then fifty year career. <br> <br> This stunning original oil on board depicts a vase of flowers on a tablecloth, on a small round table. There are yellow marigolds, and carnations in both pale pink and dark pink, with a little green foliage behind. The cloth and background are examples of a technique similar to the classic impressionistic pointillism, with small dots or dabs of paint being applied to create a larger whole, a shimmering effect of rainbow colours. This painting highlights Chaleye’s skills as a master colourist. Available for sale from Big Sky Fine Art; this original oil painting by Jean Chaleye. The painting is presented and supplied in a late 20th century elaborate frame. Jean Chaleye was considered one of the most important French post impressionist artists. He was born to working class parents on 22.4.1878 at St. Etienne and died at Le Puy in 1960. He trained at the Ecole des Beaux Arts in Lyon, then at the Ecole Nationale Superieure des Beaux-Arts in Paris. He began his career as a commercial engraver then worked for a while in the textile industry where flower painting had developed as an important discipline and was used decoratively in the manufacture of silk. Along with a group of other artists he began to paint flowers in a new fashion, rendering them light and transparent and full of grace. His still life paintings of flowers, which he continued to paint throughout his life, are among his very best works. In 1902 Jean Chaleye took part in the prestigious Fair of French Artists and subsequently exhibited widely, including a retrospective at the Organerie Du Luxemburg, Paris and the Wally Findlay Gallery in New York. In 1953 the city of Marseille held a jubilee exhibition to celebrate his then fifty year career. This stunning original oil on board depicts a vase of flowers on a tablecloth, on a small round table. There are yellow marigolds, and carnations in both pale pink and dark pink, with a little green foliage behind. The cloth and background are examples of a technique similar to the classic impressionistic pointillism, with small dots or dabs of paint being applied to create a larger whole, a shimmering effect of rainbow colours. This painting highlights Chaleye’s skills as a master colourist.